It's crazy to thank a war for providing useful things. Two wars have, however, benefited the development of our country. A young Dwight D. Eisenhower helped move military supplies across the US during World War I. We take for granted the ability to travel from point A to point B on paved roads. That was not the case during the early years of the 20th Century. In 1916, there was a bill passed to improve roads, but it was little more than a suggestion and money earmarked for this was spent rather randomly. The struggles to move men and equipment over the nation's highways, once we joined the war, was not lost on Eisenhower or the government. Between 1920 and 1939, several attempts were made to improve roads deemed "critical" for national defense, particularly in the case of an invasion. The Great Depression's public works projects helped some roads be improved, but there was a lack of cohesion in construction. It took World War II for road construction to take off. Eisenhower was very impressed with the German Autobahn system. Troops and equipment moved quickly and easily across this network of roads and Eisenhower knew this would greatly enhance the US's economic engine. It was 1956 before the first Federal Transportation Act was signed and road construction began in earnest. In the week following my vacation, I stumbled upon an article (which, of course I now can't find) that said travel from New York to Chicago in 1870 took 6 weeks, 6 weeks. I thought about that as I was processing the photos from a day's journey out and a day's journey back to Virginia. Six weeks. I can't find a notation that tells me how long it took Eisenhower to move goods to the docks along the east coast once we had entered World War I. I'm guessing it was less than 6 weeks but much more than 14 hours. We think of the Interstate System as a convenience for us. Interstate 80 has been referred to as the "artery of the US" for all the truck traffic which contains billions of dollars of goods that travel it. While the civilian benefits were in Eisenhower's mind, he was also mindful that you needed to be able to move the military, fast, and that had to be done on the wide open roads of an Interstate. The "Cold War" had started and in the back of people's minds was, "Would the USSR invade us? If so, could we mobilize troops fast enough to stop them?" 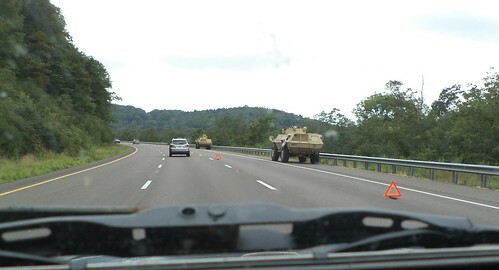 Invasion of the US by another country probably isn't likely anymore, but the movement of the military is still a common sight along the Interstate. I don't remember where I saw this but I was heading to Virginia. He whipped past me at 75 miles per hour and was lost in the traffic ahead. On the way home, I passed several pieces. These two were just stopped by the side of the road. I couldn't tell if they were disabled or what. I also wonder just how fast something like this can go. Several miles up ahead, I caught up to this group. 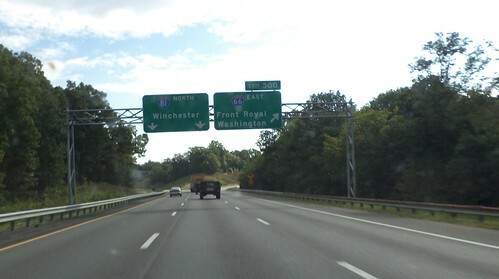 I am headed north on Interstate 81, which is along the western edge of Virginia. 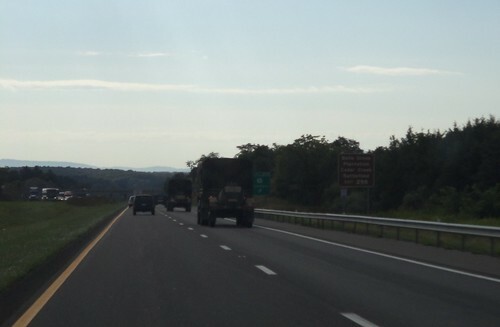 Finally, as I approached a junction, where I'll part ways with Interstate 66, I caught up to this humvee. 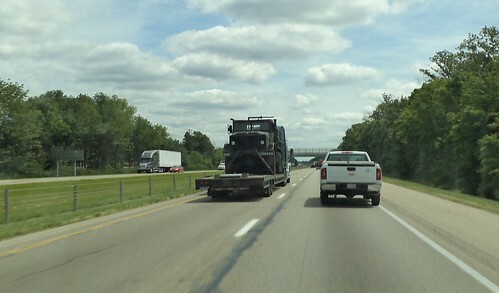 This was one of about a half-dozen vehicles headed north. Stenciled on the side was "NJ National Guard". Ah, okay. They were probably heading home after maneuvers and training. There is a fallacy that for every 5 miles of Interstate, there had to be one mile that was absolutely flat and straight. This was to enable large transport planes to land using the Interstate as a landing strip in the event of a national emergency. But it's not something planes can do. First of all, in some places, notably out west or Interstate 80 through northern Ohio, this possibly could happen. There might be stretches where the road is straight and flat enough to do that. However, overpasses, lighting, guard rails, etc, the usual items of an Interstate, would greatly prohibit landing a large aircraft. It wouldn't look real good to land a cargo plane and have the wings take off the road signs or have the thing get wedged under the "Miller's Fork Road" overpass. Perhaps the biggest deterrent to landing a large aircraft on an Interstate is that the road is not built to handle something that large and heavy falling on it. Having lived through the reconstruction of all the Interstates in and around Chicago, I've seen what goes into a complete rebuild. The runway at O'Hare is built with feet upon feet of subsurface compaction and materials. There is crushed stone under Interstate highways, but not to the depth needed to support a troop transport plane. It would look even less great to have a transport land and have the wheels poke through the asphalt of the road way, ripping off the landing gear and having the plane slide, on its belly, to a stop. That's the stuff of a Hollywood movie, not something we want in reality. So, I'll take the movement of troops and materials over the Interstate. As I passed the convoy, spread out across about 25 miles, there were women driving vehicles as well as men. I remember when that was an anomaly. They had the windows down. It was a delightful morning. It actually made me feel secure as I passed by these people.